Function First Design offers a wide variety of bike racks with unique designs that give your projects the added flair. There are 2 bike configurations up to 8 bike configurations. The Floor Mount Stand-Up is a vertical bike parking & security system designed by Function First Bike Security. 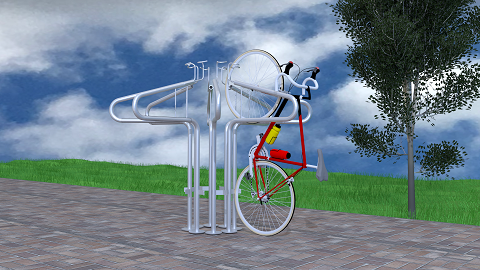 It is an easy to use vertical bike rack, that can be configured to fit almost any space. This vertical bike rack does not require lifting of the bike. Simply stand the bike up on its back tire, put the back wheel against the wheel block, hook the front wheel at top and the bike falls securely in Place. This vertical bike rack is available in several variations, Wall Mount, Floor Mount, and Vertical Flow (5 Bikes). This vertical bike rack is U-Lock compatible. Function First Design, LLC manufactures creative, functional, commercial bike security racks. For 20 + years the company has been a leader in the design of highly functional bike racks that are also aesthetically pleasing as well. Great design has always been a primary concern with the design of the outdoor bike security racks. Architects can immediately see how the these racks add style to any setting. Functionality, well what can we say, it was so important to us we put it in our name, Function First Design. 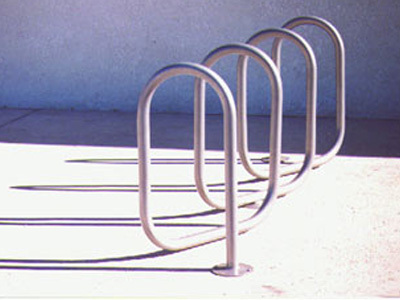 Our commercial outdoor bike racks are manufactured with US made steel, that has high recycled content. Our painting process contain no solvents and therefore emit negligible, if any, polluting VOCs into the atmosphere. All of our manufacturing is done in Tucson, Arizona with the highest level of quality.